Please note that we have experienced difficulties with older browsers like Internet Explorer. Please consider using a modern browser (Edge, Firefox or Chrome). If you still have difficulties, please just contact joseph.wang@uibk.ac.at. Due to the new General Data Protection Regulation, we have to change the process of paper submission. 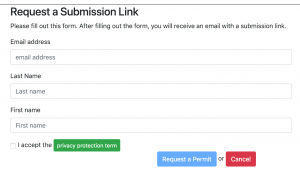 The following document describes how we have to collect data in order to process your submission. Please click on “HERE to get a submission URL”. After passing the Captcha test you will have to enter your personal data (name and email-address) to obtain a link. We will also ask you to accept our data protection terms in order to be able to process your submission. The link will be sent to your email-address. After successfully submitting a paper, you will also receive an email on the submission. After you have submitted the paper, we will send you an email acknowledging that the submission was successful. If there is any formal or technical problems with your submission, we will contact you through email. We will inform you on the result of the review. Any other emails concerning either your submission or your participation on the symposium. 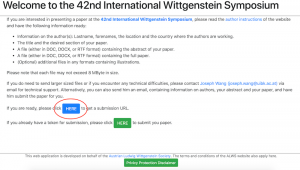 Few people have access to the email-addresses and personal data in the database: The office of ALWS, the organizers of the symposium including editing personal, the reviewers, and the system administrator. We will not give these data to any third party without your consent. The database will be erased after the symposium has taken place.